Time zones define the difference of the respective local time to Greenwich Mean Time (GMT) and the rules for daylight saving time changeover. With the existing possibilities of global online exchange of data and information, the exact knowledge of the time zone of the communication partner plays a major role in order to avoid misunderstandings and errors. Due to the widespread use of GPS devices or geolocation based on IP addresses, it is often not a big problem to get to the geographic coordinates of a place. The determination of the time zone from these coordinates is then however not a trivial matter, because the time zone boundaries do not follow uniform rules, but are based on - temporarily changing - political and geographical circumstances. Thus, the time zone boundaries are the same as the state borders in Central Europe. Their naming follows the scheme "Europe/capital". For example, Germany belongs to the Time Zone Europe/Berlin, France to Europe/Paris and Croatia to Europe/Zagreb. For large area countries, such as Canada or the United States, this rule no longer applies, because a subdivision of the territory into several time zones is required. Every country may handle the concrete division as it would like. In the US there are beside the great time zones such as America/Los_Angeles, America/Chicago or America/New_York some small time zones for counties, for example, America/Kentucky/Louisville or America/Indiana/Indianapolis. On land, this simple method no longer works. Here one needs an accurate map, which contains the time zone boundaries and their names. Logically, this map should not consist of paper but should be evaluated by software. An often-used format for such "electronic" maps is the ESRI shapefile. This is a vector map that allows the mapping of exact geometrical shapes by points, lines and polygons. In addition, attributes can be defined to attach geographic names and properties to the geometry. Thankfully Eric Muller presents at efele.net/maps/tz/ shapefiles for different regions to download. 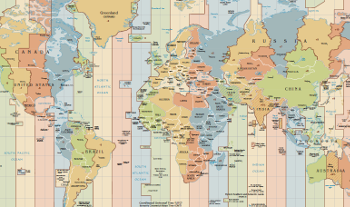 The file tz_world.zip contains the time zones around the whole world as polygons. It represents a good starting point for further experiments. These shapefiles are no longer supported. An alternative is timezone-boundary-builder by Evan Siroky. At the Releases page are shapefiles timezones.shapefile.zip generated from actual OpenStreetMap data. First you should unpack the zip file into an empty directory. The files always belong together! Although in common geographical software the file tz_world.shp resp. combined_shapefile.shp is called "the shapefile", the other files (.dbf, .prj, ...) must be present in the same directory too! After these preparatory steps, it can go directly to programming. The complete source code is available on Github as Git repository tzdataservice. This means that tz_world contains two features: Once the polygon geometry the_geom and on the other the names (IDs) of the time zones as a string in TZID. The shapefile from evansiroky/timezone-boundary-builder has a similar structure, but the name of the time zone attribute is tzid here. The geometry has the reference system SRID 4326, that is, the points are encoded in the reference system WGS84 by means of geographical coordinates from 180° West to 180° East and 90° South to 90° North. That's exactly the same system which popular map applications like Google Maps and OpenStreetMap or the GPS system are using. With the two previously described methods it is now possible to determine the time zone on continents, islands and in international waters. What's missing are the coastal waters belonging to the state territory. Their borders are not included in tz_world.shp. The newer shapefiles from timezone-boundary-builder already include the coastal waters! Therefore the following algorithm need not to be applied. With the shapefiles from efele.net you may estimate the borders with the rule that coastal waters should have a maximum dimension of 12 nautical miles (about 22 km). With this information, you can use the filter dwithin which also finds points that are near a polygon. Unfortunately, the possibility to pass a unit of length, such as "km", to the filter is not implemented. GeoTools interprets the numerical value always relative to the reference system of the map. The value 0.1 used in the sample code therefore means 0.1°. That are approximately 11 km in north-south direction. Particularly interesting is the speed of the algorithm and its accuracy. For that purpose I used the text file cities15000.txt from geonames.org as input. It contains the coordinates and time zones of 23461 places all over the world. A computer with a Core2 Quad Q8400 processor manufactured in 2010 needed four and a half minutes to determine the time zones of all 23461 records, which are just 11 ms per location. The results differed for 407 records, that is an error of 1.7%. An analysis of the errors brought no clarity as to whether the errors are in the shapefile, in the algorithm or in the geonames database. However, the very good performance comes about only when the the shapefile is loaded only once for all 23461 records. A repeated startup that calls openInputShapefile for each coordinate would degrade the performance dramatically. As a finale, a REST web service should now provide the method to determine the time zone from coordinates. The service can be implemented in the way that loading and indexing of the shapefile takes place only once. The determination of a single time zone can be performed then very fast, because all the necessary data are already in the memory. The use of HTTP and REST as communication protocols enables even clients, that are not programmed in Java, to determine the time zone. For my tool GEOPosition I use for example PHP with curl as a client. To complete the program a main function is required. It performs the one-time loading of the shapefile and starts the built-in Java 7 HTTP server on port 28100. You may use other ports of course. The server is bound only to the loopback interface with the IP address 127.0.0.1 for security reasons. The class definition has the JAX-RS annotation @Path. When the HTTP server starts, Jersey searches all classes for this annotation and registers them as a web service at the specified path. A new test with cities15000.txt demonstrates the function of the web service. As expected the performance is worse than the direct call, but is still quite good with about 60 ms per query. In addition, the server is able to process simultaneous requests in multiple threads in parallel. The web service has been running for several years stable on my website. It provides time zone information for the tool GEOPosition. It shows - in addition to the time zone - the coordinates, the altitude above sea level and the times for sunrise and sunset for any location on Earth. To be able to display the latter in local time, the knowledge of the exact time zone is required as well. The complete software is available at Github. I works with the older shapefiles from efele.net as well as with the actual version from timezone-boundary-builder.